1 The capital was later moved to Baturyn and then Hlukhiv. The Hetmanate or officially Viysko Zaporozke (Ukrainian: Гетьманщина, Het’manshchyna; Військо Запорозьке, Viys’ko Zaporoz’ke) was a Cossack state in the central and north-eastern regions of Ukraine during 1649–1775. It came into existence as a result of the Khmelnytsky Uprising and the alliance of the registered Cossacks with the Cossacks of the Zaporozhian Sich and other segments of the Ukrainian populace. 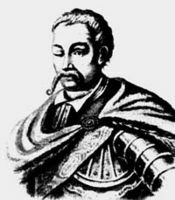 The Hetmanate's first hetman, or leader, was Bohdan Khmelnytsky, who ruled from 1648–57. Independent from Poland in 1648, in 1654 the Hetmanate became a suzerainty of the Tsardom of Russia as a result of the Treaty of Pereyaslav (Pereyaslavska Rada) of 1654. The Treaty of Andrusovo (Andrusiv) of 1667 divided the state between Russia and Poland. This division caused the civil war Ukraine between various parties of Ukrainian Cossacks that lasted till the end of the seventeenth century. In the eighteenth century the territory of the Hetmanate was limited to left-bank Ukraine. In 1764, the autonomy of the Cossack state and the post of hetman were abolished by Catherine the Great. Its capital was at Chyhyryn, and later at Baturyn and Hlukhiv. The Hetmanate state consisted of most of what is now central Ukraine and a small part of today's Russia. Specifically, it's territory included what is now the oblasts (provinces) of Chernihiv, Poltava, and Sumy (without the southeastern portion), the left-bank territories of Kiev and Cherkasy, as well as the western portion of Bryansk Oblast of Russia. 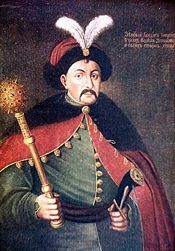 After many successful military campaigns against the Poles, Hetman Bohdan Khmelnytsky made a triumphant entry into Kiev on Christmas 1648 where he was hailed liberator of the people from Polish captivity. In February 1649, during negotiations in Pereiaslav with a Polish delegation, Khmelnytsky had made it clear to the Polish that he was the sole autocrat of Rus', positioning himself as the leader of all Ukraine. Khmelnytsky demonstrated his statesmanship in all areas of state-building: in the military, administration, finance, economics, and culture. He invested the Zaporozhian Host under the leadership of its hetman with supreme power in the new Ukrainian state. The Zaporozhin Host were Cossacks who lived in Zaporozhia, in Central Ukraine. The Zaporozhian Host grew rapidly in the 15th century by serfs fleeing the Polish Lithuanian Commonwealth. The name Zaporozhtsi comes from the location of their fortress, the Sich, in Zaporozhia, the "land beyond the rapids" (from za "beyond" and poróhy "river rapids"). During the course of the sixteenth, seventeenth, and well into the eighteenth centuries the Zaporozhian Cossacks became a strong political and military force that challenged the authority of Poland-Lithuania, the Ottoman Empire and its vassal the Crimean Khanate, and the Tsardom of Russia. The Host went through a series of conflicts and alliances involving the three powers before being forcibly disbanded in the late eighteenth century by the Russian Empire. Khmelnytsky unified all the spheres of Ukrainian society under his authority, building a government system and a developed military and civilian administrators out of Cossack officers and Ukrainian nobles, establishing an elite within the Cossack Hetman state. After the Crimean Tatars betrayed the Cossacks for the third time in 1653, Khmelnytsky realized he could no longer rely on the Ottoman support against Poland, the hetman was forced to turn to Muscovy for help. Negotiations began in January 1654, in Pereiaslav, between Khmelnytsky, and numerous cossacks and on the Muscovite side led by Vasilii Buturlin, and concluded in April in Moscow by the Ukrainians Samiilo Bohdanovych-Zarudny, and Pavlo Teteria and by Aleksey Trubetskoy, Vasilii Buturlin, and other Muscovite boyars. As a result of the treaty, the Zaporozhian Host became a suzerainty of Muscovy, and was split in two; the Cossack Hetmanate with its capital at Chyhyryn and Zaporizhia, centered around the fortress of the Zaporozhian Sich. The treaty also led to the Russo-Polish War of 1654–1667. Instead, Ivan Vyhovsky, the general chancellor of the Hetmanate and an adviser to Bohdan Khmelnytsky was elected hetman in 1657. Vyhovsky was trying to establish a more independent policy from Moscow and found himself in a middle of a civil war. A revolt, led by the Zaporozhian Otaman Yakiv Barabash and Martyn Pushkar, culminated in a bloody confrontation near Poltava in June 1658. Vyhovsky emerged victorious but weakened; he decided to break his ties with Muscovy and concluded the Treaty of Hadiach with Poland on September 16, 1658. Under the conditions of the treaty, Ukraine would become a third and autonomous component of the Polish-Lithuanian Commonwealth, under the ultimate sovereignty of the King of Poland, but with its own military, courts, and treasury, but the treaty was never implemented. It was unpopular among the lower classes of the Ukrainian society, spuring more rebellions. Eventually, Vyhovsky surrendered the office of hetman, and fled to Poland. This led to the period called "the Ruin," a constant state of civil war throughout the state during the seventeenth century. During the Ruin in 1667, the Russo-Polish war ended with the Treaty of Andrusovo, dividing the Cossack Hetmanate was into regions called the left and right-bank Ukraine. Only the Left-bank remained in the Hetmanate; the right-bank Ukraine except for the city of Kiev became part of the Polish-Lithuanian Commonwealth. The period of the Ruin was effectively over when Ivan Mazepa was elected hetman, and brought stability to the state. He united Ukraine which, once again, was under the rule of one hetman. During his reign, the Great Northern War broke out between Russia and Sweden. And Mazepa's alliance with Peter I caused heavy losses of cossacks, and Russian interference in the Hetmanate's internal affairs. When the Tsar refused to defend Ukraine against the Polish King Stanislaus Leszczynski, an ally of Charles XII of Sweden, Mazepa, and the Zaporozhia Cossacks allied themselves with the Swedes on October 28, 1708. The decisive battle took place in June. The Battle of Poltava was won by Russia, putting an end to Mazepa's hopes of Ukraine independence, promised by the Swedes in an earlier treaty. During the reign of Catherine II of Russia, the Cossack Hetmanate autonomy was progressively destroyed. After several earlier attempts, the office of hetman was finally abolished by the Russian government in 1764, and his functions were assumed by the Little Russian Collegium, thus fully incorporating the Hetmanate into the Russian Empire. On May 7, 1775, from a direct order from the Empress Catherine II, the Zaporozhian Sich was to be destroyed. On June 5, 1775, Russian artillery and infantry surrounded the Sich, and razed it to the ground. The Russian troops disarmed the Cossacks, the treasury archives were confiscated. The Koshovyi Otaman Petro Kalnyshevsky was arrested and exiled to the Solovki. This brought an end to the Zaporozhian Cossacks. The Kyiv Mohyla Academy as seen today. The Hetmanate flourished under Mazepa's rule, particularly in literature, and architecture. The architectural style that developed during his reign was called the Ukrainian Baroque style. Certain features of the Ukrainian baroque, such as bud and pear-shaped domes, were borrowed by the similar Naryshkin baroque movement in seventeenth-eighteenth century Moscow. Visitors from abroad commented on the high level of literacy, even among commoners, in the Hetmanate. There was a higher number of elementary schools per population in the Hetmanate than in either neighboring Muscovy or Poland. In the 1740s, of 1,099 settlements within seven regimental districts, as many as 866 had primary schools. A German visitor to the Hetmanate, writing in 1720, commented on how the son of Hetman Danylo Apostol, who had never left Ukraine, was fluent in the Latin, Italian, French, German, Polish and Russian languages. Under Mazepa, the Kiev collegium was transformed into an Academy and attracted some of the leading scholars of the Orthodox world. Mazepa established another Collegium in Chernihiv. Many of those trained in Kiev, such as Feofan Prokopovich (founder of the Russian Academy of Sciences) would later move to Moscow, so that Ivan Mazepa's patronage not only raised the level of culture in Ukraine but also in Moscow itself. A musical academy was established in 1737 in the Hetmanate's then-capital of Hlukhiv. Among its graduates were Maksym Berezovsky, the first composer from the Russian Empire to be recognized in Europe, and Dmitry Bortniansky. 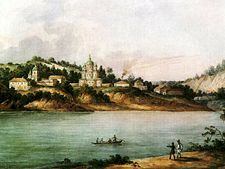 The Mezhyhirskyi Monastery, located on the right bank of the Dnieper. Fyodor Solntsev, 1843. In addition to traditional printing presses in Kiev, new printing shops were established in Novhorod-Siverskyi and Chernihiv. Most of the books published were religious in nature, such as the Peternik, a book about the lives of the monks of the Kiev-Pechersk monastery. Books on local history were compiled. In a book written by Inokentiy Gizel in 1674, the theory that Moscow was the heir of ancient Kiev was developed and elaborated for the first time. In 1686, the Orthodox Church in Ukraine switched jurisdiction from the Patriarch in Constantinople to the authority of Moscow. Nevertheless, before and after this date local Church leaders pursued a policy of independence. Hetman Ivan Mazepa established very close relations with Metropolitan Varlaam Iasynsky (reigned 1690–1707). Mazepa provided donations of land, money and entire villages to the Church. He also financed the building of numerous churches in Kiev, including the Church of the Epiphany and the cathedral of St. Michael's Golden-Domed Monastery, and the restoration of older churches such as Saint Sophia Cathedral in Kiev which had deteriorated to a state of near ruin by the mid-seventeenth century. The St. Michael's Golden-Domed Cathedral in Kiev, built with funds from Hetman Ivan Mazepa. As had been the case under Poland, the nobility continued to be the dominant social class during the Hetmanate, although its composition and source of legitimacy within the new society had changed significantly. During the Khmelnytsky Uprising the Polish nobles and Polonized Ruthenian magnates fled the territory of the Hetmanate. As a result, the noble estate now consisted of a merger between the nobility that had stayed in the territory of the Hetmanate (old noble families that did not succumb to Polonization and lesser nobles who had participated in the uprising against Poland on the side of the Cossacks) with members of the emergent Cossack officer class. Unlike the Polish nobles whose lands were redistributed, the nobles loyal to the Hetmanate retained their privileges, their lands, and the services of the peasants. Together, the old nobles and the new Cossack officers became known as the Distinguished Military Fellows (znachni Viiskovi Tovaryshi). Thus, noble status now depended not on ancient heredity but on loyalty to the Cossack state. Over time, however, Cossack officer lands and privileges too became hereditary and the Cossack noble and officer class acquired huge landed estates comparable to those of the Polish magnates whom they replaced. A Zaporozhian Cossack painted by Serhiy Vasylkivskiy c. nineteenth century. Most Cossacks failed to enter the noble estate and continued their role as free soldiers. 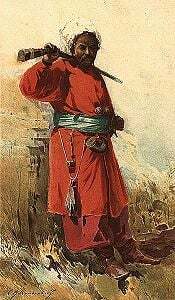 The lower rank Cossacks often resented their wealthier brethren and were responsible for frequent rebellions, particularly during the the Ruin, a period of instability and civil war in the seventeenth century. These resentments were frequently exploited by Moscow. The Zaporizhian Sich served as a refuge for Cossacks fleeing the Hetmanate as it had been prior to Khmelnytsky's uprising. During the Hetmanate, the Roman Catholic Church and Uniate Clergy were driven from Ukraine. The Black, or monastic, Orthodox clergy enjoyed a very high status in the Hetmanate, controlling 17 percent of the Hetmanate's land. Monasteries were exempt from taxes and at no time were peasants bound to monasteries allowed to forego their duties. The Orthodox hierarchy became as wealthy and powerful as the most powerful nobles. The white, or married, Orthodox clergy were also exempt from paying taxes. Priests' sons often entered the clergy or the Cossack civil service. It was not uncommon for nobles or Cossacks to become priests and vice versa. Peasants comprised the majority of the Hetmanate's population. Although the institution of forced labor by the peasants was reduced significantly by the Khmelnytsky Uprising, in which the Polish landlords and magnates were expelled from the territory controlled by the Hetman, those nobles loyal to the Hetman as well as the Orthodox Church expected the peasants under their control to continue to provide their services. As a result of the Uprising, approximately 50 percent of the territory consisted of lands given to Cossack officers or free self-governing villages controlled by the peasants, 33% of lands owned by Cossack officers and nobles, and 17 percent lands owned by the Church. With time, the amount of territory owned by the nobles and officers gradually grew at the expense of the lands owned by peasants and rank-and-file Cossacks, and the peasants were forced to work increasingly more days for their landlords. Nevertheless, their obligations remained lighter than they had been prior to the Uprising and until the end of the Hetmanate peasants were never fully enserfed, retaining the right to move. The Hetmanate was divided into military-administrative districts known as regimental districts (polki) whose number fluctuated with the size of the Hetmanate's territory. In 1649, when the Hetmanate controlled the Right and the Left Banks, which included 16 such districts. After the loss of the Right Bank, this number was reduced to ten. The regimental districts were further divided into companies (sotnias), which were administered by captains. Russians and other non-local landlords were allowed to remain in the Hetmate, but no new peasants could be brought in from the North. In 1764, the office of Hetman was abolished by Catherine II and its authority replaced by a second Little Russian Collegium consisting of four Russian appointees and four Cossacks headed by a president, Count Peter Rumyantsev, who proceeded to cautiously but firmly eliminate the vestiges of local autonomy. In 1781, the regimental system was dismantled the Little Russian Collegium abolished. Two years later, peasants' freedom of movement was restricted and the process of enserfment completed. Cossack soldiers were integrated into the Russian army, while the Cossack officers were granted status as Russian nobles. As had previously been the practice elsewhere in the Russian Empire, lands were confiscated from the Church (during the times of Hetmanate monasteries alone controlled 17 percent of the region's lands ) and distributed to the nobility. The territory of the Hetmanate was reorganized into three Russian provinces whose administration was no different from that of any other provinces within the Russian Empire. ↑ Encyclopedia of Ukraine, Cossacks at the Encyclopedia of Ukraine. Retrieved March 27, 2017. ↑ Paul Robert Magocsi, A History of Ukraine (Toronto: University of Toronto Press, 1996, ISBN 0802008305), 285. ↑ Volodymyr Sichynsky, Ukraine in Foreign Comments and Descriptions from the VIth the XXth Century (New York: Ukrainian Congress Committee of America, 1953). ↑ 4.0 4.1 Magocsi (1996), 259. ↑ 8.0 8.1 8.2 Magocsi (1996), 252. ↑ 10.0 10.1 Magocsi (1996), 235. Encyclopedia of Ukraine. Cossacks at the Encyclopedia of Ukraine. Retrieved February 19, 2009. Magocsi, Paul Robert. A History of Ukraine. Toronto: University of Toronto Press, 1996. ISBN 0802008305. Sichynsky, Volodymyr. Ukraine in Foreign Comments and Descriptions from the VIth the XXth Century. New York: Ukrainian Congress Committee of America, 1953. OCLC 269074. All links retrieved March 27, 2017. Hetman state L. Okinshevych and A. Zhukovsky, Encyclopedia of Ukraine. This page was last modified on 27 March 2017, at 16:22.